Part I NASA's Pluto-skimming podule, New Horizons, is now within a million miles of its freezeworld target - but we won't get the data 'til later. While the spacecraft and the dwarf planet are a mere skip from each other in galactic terms, the flyby is far from settled for NASA's IT staff, who used a well-deserved coffee break to kindly fire back emails to The Register. Gabrielle Griffith, New Horizons' senior ground systems engineer, patiently explained how the modern Mission Operations Center differs from El Reg's romantic ideas of Mission Control as pictured in photographs from the Apollo missions. Based at Johns Hopkins University Applied Physics Laboratory, Griffith explained that "the Mission Operations Centre today is an intricate design of hardware and software that is utilised to build and test command loads, process telemetry, and communicate with the spacecraft." NASA's Christopher C. Kraft, Jr. Mission Control Centre, famously known by its radio call-sign Houston, is based in the Lyndon B. Johnson Space Center in Houston, Texas. Houston remains NASA's flight control centre for its human spaceflight programs, currently operating to ensure its astronauts can get safely aboard the International Space Station. The unmanned New Horizons probe is operated from the Mission Operations Center at Johns Hopkins. 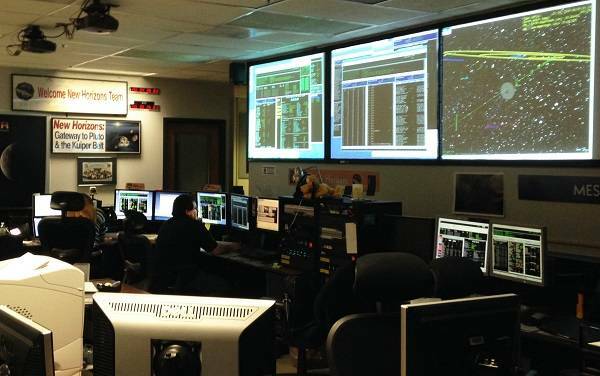 New Horizons Mission Operations Center at the Johns Hopkins University Applied Physics Laboratory in Laurel, Maryland. "There are many different aspects to the design [of the Mission Operation Centre] with IT security, diversity, usability, and cost being primary design criteria," Griffith said. "The design is based on a Common Ground System Architecture (CGSA) that the Space Exploration Sector's SOF Group designed to reduce cost across multiple missions by providing a familiar architecture for IT administrators and users," said Griffith. It utilises "common infrastructure for networks, backup services, data mirroring, web serving, perimeter security, environmental stability, and telecommunications," to ensure that the flight controllers and mission analysts can plan, monitor, and operate the spacecraft. The flight controllers and mission analysts will do this while working closely with the multi-institutional science team, the science operating team in Boulder, Colorado, as well as the mission design team at APL, and the navigation team at KinetX, based in Simi Valley, California. Through all this they will be supported by the IT staff, which Griffith said "comprises Ground System Engineers and UNIX administrators that maintain all of the networks and systems utilised by the Mission Operations Center and the Spacecraft Engineers."